I graduated from Walsh High School in a rural area of Colorado in 1984. Fast forward 34 years <wince> and I am graduating again with now my final degree. In 1984 I was a healthy young woman with a moderate hearing loss in one ear. In 2018 I am a middle-aged woman in a perpetual state of getting healthy <wince>, profoundly deaf (and “hearing again” as long as I am wearing my bionics) and an adult with disability from Meniere’s disease and Post Concussive Syndrome. It may surprise you to learn that I am happier and healthier (emotionally and psychologically) than I was at the age of 18. Life has been hard – and continues to be, but doesn’t everyone experience that in some form or fashion? My challenges have made me who I am today. The 2018 Denise, has found a life worth living by embracing my unique challenges and focusing my life and energy in the disability community. Oh yes! It’s hard sometimes… dark even; however, I am amongst friends, fellow warriors, super heroes, and advocates. May I just say, “THANK GOD FOR THE INTERNET”? There are numerous research studies that support that the Internet has connected, educated, and created a platform for advocacy for those with disability. The community, the friends I have found over the last 34 years has made every challenge I’ve shouldered worth it. Most of the people with disabilities I have come to know have different challenges and diagnoses. Yet all work hard to experience the best quality of life they can. We use a variety of accessibility tools, medications, assistive devices, and medical procedures to maximize every opportunity while insisting on a productive and meaningful life. We are stubborn. We believe in self-care. Our priorities tend to be the things that really matter. Some of us are Spoonies. My dissertation, something I have become quite passionate about, revolves around the theory that traumatic events and diagnoses do not have to destroy a person. As a matter of fact, a wealth of research (my own included) supports that these events can stimulate growth – the foundation of Posttraumatic Growth studies. This doesn’t mean that I do not have bad days. They happen. Those bad days are something you recognize and experience as well. Yet I have learned that walking in the dark and challenging path of life with disability with all OF YOU, is far better than any walk I took on the lighted, well-tended path alone. I’ve also learned to CHOOSE HAPPINESS and to do my best to spread that message. It may seem like a difficult choice some days, but cognitive psychologists agree that if you deliberately change your thinker (your chooser), it will change your feeler, and show in a change in your behavior. It is amazing what “choosing happiness” can do to your personal outlook. Don’t be afraid to embrace the days you scream and cry and cuss up a storm (sorry mom). Those days will happen as well. I have learned though that if my focus is positive advocacy and choosing happiness, those screaming days are few and far between. I’ve always admired Helen Keller. This intelligent and gifted woman had neither sight nor hearing. Yet Helen learned that her life “in the dark” was pleasantly full of like-minded friends and associates. She knew the value of walking in the dark with a friend. I hope you can learn to embrace that mindset as well. Always thrilled to have a guest writer here at Hearing Elmo. If you live with chronic illness or a visible/invisible disability and love to write, I invite you to post in this venue to share your story. I was a little bit grumpy when I went into work this morning. Just your ordinary kind of grumpy, at least I think that’s what it was at the time. We had a staff meeting scheduled for 9:30. I was walking down a hall at 9, about to get some water from the kitchen, when I saw a teammate who said “we’re meeting in the first floor conference room”. Thinking I’d lost track of time, I said, doesn’t it start at 9:30? He shrugged and said “sometimes it’s different”. Later, I found out what he meant, but at that moment I was walking in the wrong direction, sans water, notepad, calendar, and orientation. I rushed to grab my things and when I walked in, everyone was seated. Now, let me mention that I am relatively new on this job, and the folks are really nice and teach me a lot about what goes on there. Today, though, I was already grumpy, and now I was LATE (and still didn’t have anything to drink because I’d forgotten to fill up in my haste). I sat at a place around the large, squared set up of tables, strategic for what I knew would be best for me, able to see the faces of everyone should I have trouble hearing anyone. My supervisor said “sit where there are papers” meaning the agenda and other materials. Well, the seats available were not strategic for me, and I was already feeling grumpy and it was obvious that I was late and slightly holding things up. I said “everyone forgets that I am hard of hearing and need to sit where I can best follow what’s going on. So, if it’s alright by you, I’m just going to get these papers and sit over here”, walking to where I intended to sit and feeling quite determined about that fact. Meanwhile, supervisor gestured as if to say “come sit by me”. I did not want to explain why that would not be ideal, and she was trying to be helpful, but it wasn’t helpful, and by the way I was feeling more and more like a grump at this point. Further, I was feeling like a weirdo. An oddball. Someone who needs something special. I deeply dislike standing out, or seeming like I need something unusual. Everyone else was sitting wherever they wanted to, and I had to have this mini-scene because, as I stated rather unprofessionally, no one seems to remember that I’m deaf and use cochlear implants to hear. At the risk of sounding like I’m bragging, among cochlear implant users, I am a super high performer. I am pleased and even thrilled by what I am able to do hearing-wise. Then I get in a typical work situation, and suddenly: I’m a weirdo. It does not help that I am also something of an introvert, friendly, social, smart, funny, but I need tons of time to process and recharge. I really don’t think it has much to do with my hearing, either, as I had relatively normal hearing for the first 10, 12 years of life but was always this way. So I seem a little odd compared to the norm in terms of social interaction to begin with, and then there’s the hearing loss and the special needs. You know? Most of the time, really and truly most of the time, I am OK with being deaf and hearing again with cochlear implants. I am glad to educate and inform and certainly to advocate for myself (although I have work to do in this regard, and tend to be much better at advocating for others). Today, I wasn’t in the mood. 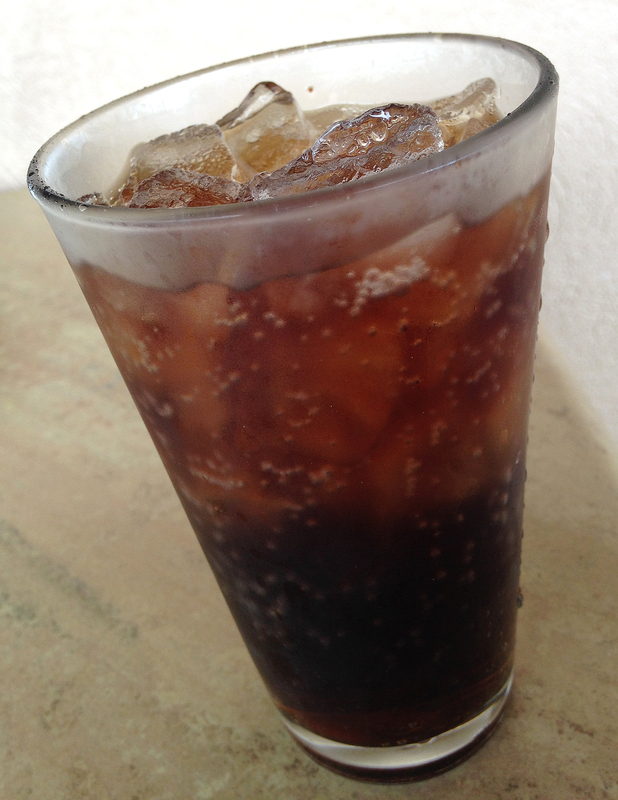 I finally got something to drink, and good thing, because I ended up sitting through three meetings before the day was done. It did give me time to forgive myself, for feeling badly, for not feeling comfortable about asking for what I needed. I was also glad that I have become that person who knows what she needs and while the sending of the message might be a challenge at times, I can say no, I don’t need that, I need another thing, and know how to pursue what enables me to perform and participate at work. I walked through my apartment door at the end of the day thinking I either needed a drink (the after-five kind), or a good cry. I remembered I had some delicious food to make for supper, and having eaten and cleaned up, I sat and wrote this down. I don’t feel so grumpy anymore. Deborah is a bilateral cochlear implant recipient. She experienced familial progressive hearing loss, which presented at age 10. Her first ear was implanted in 2005, the second ear in 2008. A native New Yorker, she presently resides in the central Piedmont of North Carolina. She is involved with HLA-NC, and is passionate about issues related to substance abuse, addiction, and mental health, serving as coalition coordinator for Project Lazarus of Randolph. In her spare time she enjoys traveling as much as possible, and can frequently be found wandering the backroads and practicing nature photography in the nearby Uwharrie National Forest. I apologize for how long it has been since I have posted anything. I am one week from finishing all my coursework towards my Ph.D. and have been busy working, going to school, and finalizing my dissertation committee. To say I’m exhausted is an understatement. I try to be serious and mindful about how much rest I am getting. I was thinking last week when I turned the big 5-0, that I have now lived longer as a person with disABILITY and chronic illness than I lived without those challenges. It influences what I have chosen to study and what I am passionate about. When you are ABD (All But Dead — just kidding: all but dissertation), you tend to think about your dissertation each and every day. This means that everything I am reading and researching for the literature review of my own work is on my mind each and every day. I even dream about it! “Predictors of Posttraumatic Growth in Persons with Acquired Disability” takes up much of my brain power. These past few days I have been “chasing a rabbit” (like my retired service dog, Chloe) and reading published articles on mindfulness as it incorporates one of the major domains of posttraumatic growth. I suppose “mindfulness” started out as a Buddhist tradition; however, in the last 8-9 years, the field of psychology has come to recognize it as a means to treat numerous physical and psychological disorders. In my short personal history of 25+ years, I have learned that folks with acquired physical challenges–whether the result of illness, accident, or genes–also experience comorbid anxiety or mood disorders (Carson, Ringbauer, MacKenzie, Warlow, and Sharpe, 2000; Siegert & Abernathy, 2005; Weintraub, Moberg, Duda, Katz, and Stern, 2004). You do not have to convert to Buddhism to practice mindfulness. Kozlowski (2013), explains that mindfulness has been Westernized by psychology and “it is purposefully devoid of spiritual or religious connotations and focuses simply on the act of awareness. And if you want to take it to a level that we can all relate to and understand, at its core is stress reduction” (para. 5). You’d think as someone who has worked so hard to hear again, I would rarely purposely “go deaf”. Yet, I have discovered that if I want to do some deep thinking, praying, and just spend some time being aware of all the “stuff” in my life, I have to reach up and click my cochlear implant off. I need the quiet to take the time to be mindful of what is currently stressing me (and how to de-stress), what my priorities are, and how I can make a difference TODAY in the life of someone – ANYONE. My bionic hearing is wonderful, but I cannot focus when my processor is busy – processing. So I “go deaf” – on purpose. I need to reduce distractions. For me that means being alone with my thoughts and perhaps a pad of paper nearby so I can jot things down as I think of them. 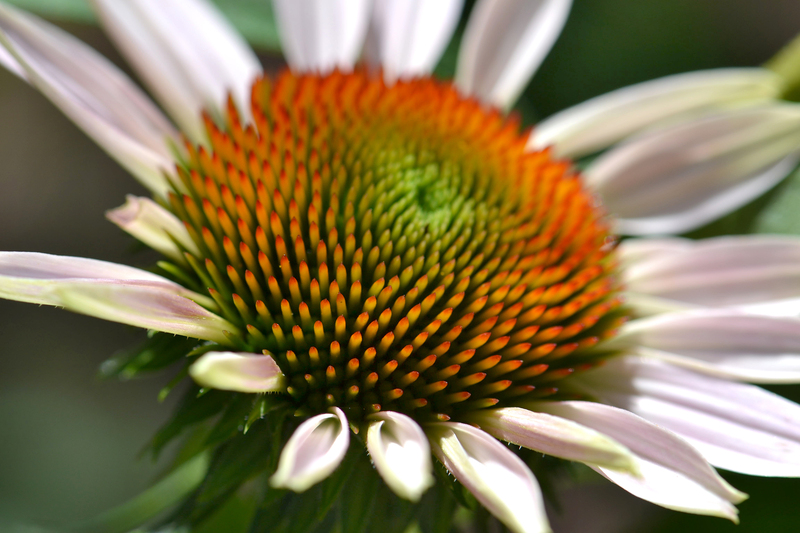 Learning to be mindful, meant that I learned to change how I view disABILITY and illness. I learned not just to experience my “new normal”, but to own it. With that acceptance came the understanding that I am able to make a difference in such a way that I would not have been able to had my “normal” not changed. I likely wouldn’t know the people I know. I would not have been drawn to studies about posttraumatic growth. I wouldn’t have chosen to invest my time in student populations of individuals with visible and invisible conditions. My life – that I embrace and love – would not be what it is today. Learning to be mindful also taught me to prepare. I knew before this ten-day deluge of rain that I was going to have a much tougher time with my balance. I deliberately scheduled an additional hour of sleep each night, made sure I had my cane and service dog equipment ready to go each morning, placed my umbrella and rain boots by the back door, planned where to park to eliminate having to by-pass major puddles of standing water, deliberately stayed where I could see outside to determine when the rain had let up enough to take the service dog out or to make a quick trip to the campus testing center or copy center, and made sure that I allowed extra time to get to where I needed to go each day because I knew my mobility issues would require I traverse slowly and methodically. Even though the sun sets much later now that it is the month of May, I made sure that I had someone to drive me for evening obligations as I knew my vertigo would be worse by day’s end. Being mindful about the forecast and likely changes in my symptoms, meant that I could “hope for the best and prepare for the worst“. A nice little “perk” of Meniere’s disease is that if you learn to recognize the changes, you discover that you are a living, breathing, and walking barometer. (I’m likely more exact that local forecasters). 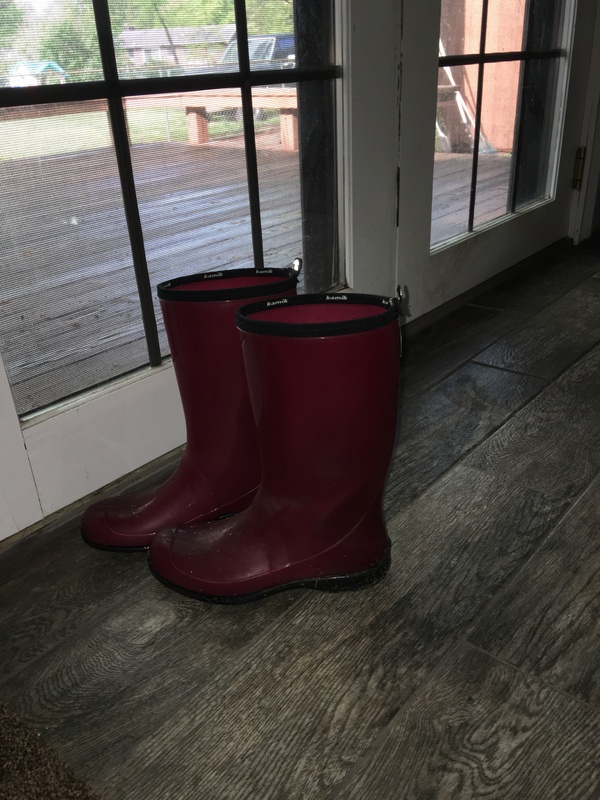 So… when the skies opened up, and delivered mist & sprinkles, steady, significant amounts of rain, and at times-torrential downpours, I was as ready as I could be! I suppose some folks might think that being so mindful and preparing for worsening symptoms, is the equivalent of being self-centered. I have learned the hard way, however, that if I do not take care of myself, it is impossible for me to take care of anyone else. I MUST take deliberate steps to insure I am prepared for long periods of rain, for example. If I do not, I will be nearly useless to anyone else. I’m not trying to avoid or escape the worsening symptoms I know are to come with a long bout of rainy weather. It is a type of cognitive-restructuring (from the psychologist’s point of view). As a person of faith, I work at being “mindful” of His promises. It helps me to remember He is mindful of me (Psalm 8:4, Psalm 111:5, Psalm 115:12, Romans 8:5-7, Romans 12:2, 1 Corinthians 2: 9-12, 16, Colossians 3:1, and 2 Peter 3:2). Mindfulness doesn’t mean I do not have “bad days”. Being mindful, doesn’t mean I will always be in a super, good mood. However, being mindful gives me a better perspective and deeper appreciation for what really matters. I can more quickly rebound from self-pity and look for opportunities to make a difference – even in a sometimes “broken” body and weary mind. Being mindful allows me to wake up to a Milo-bear (service dog) alarm-clock with an attitude of “BRING IT ON“. For me… it makes a difference. Carson, A. J., Ringbauer, B., MacKenzie, L., Warlow, C., Sharpe, M. (2000). Neurological disease, emotional disorder, and disability: They are related: A study of 300 consecutive new referrals to a neurology outpatient department. J. Neural Neurosurg Psychiatry, 68:201-206. Siegert, R. J., Abernethy, D. A. (2005). Depression in multiple sclerosis: A review. J. Neural Neurosurg Psychiatry 76:469-475. 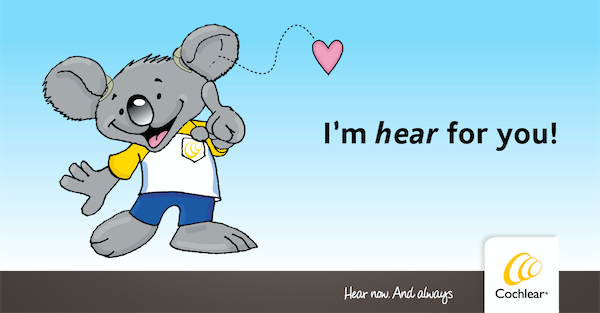 I’m reaching out on behalf of Cochlear Americas. We created Valentine’s Day cards for those in the hearing loss community to share with whomever they HEARt this Valentine’s Day. If you think the Hearing Elmo community would be interested in these cards, please feel free to share them! We have four Valentine’s Day cards that you can download, print, cut out and distribute directly from our Hearing Connections blog. We will also be sharing the cards on our Facebook, Twitter and LinkedIn channels. Keep an eye out for them to appear and share them digitally if you’d like. Print and distribute them in person or by mail with friends, family or colleagues. Share them on your social channels. If you have children, print for your child to distribute during their school Valentine’s Day party. 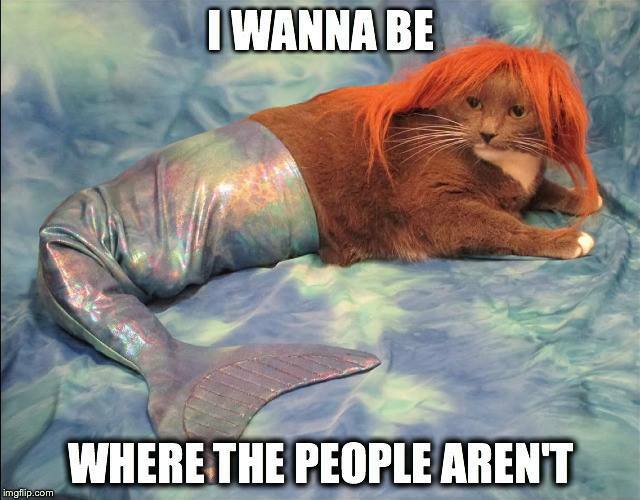 I recently saw the above picture on FaceBook, and since I love “The Little Mermaid”, (and because I know cats can be SO “offended”), I found this VERY funny. As an Introvert, I often want to be where the people AREN’T. I, and most Introverts, love people. However, folks misunderstand what an introvert, and extrovert are. There is even a newly labeled “blend” for those who exhibit both introvert and extrovert tendencies (lest others think we have multiple personalities, or Dissociative Disorder). Evidently an Ambivert, is one who has both characteristics, often in dependence on their role in that specific environment. The difference between an Introvert and Extrovert, however, is simply how a person prefers to RECHARGE. It has nothing to do with whether or not they like people. Extroverts recharge by being around others. Introverts recharge by being alone. All this thinking about “versions” had me contemplating how each dimension is effected by acquiring a disability. As a person who is differently-abled, my mind just “goes there” automatically when I think about personality characteristics. Who copes “better” with acquired disability? An Introvert or Extrovert (or Ambivert)? Interestingly, research shows that people who are extroverted are more likely to acquire a disability that limits mobility or results in chronic pain (Malec, 1985). Evidently extroversion can be equated with higher risk behavior and decisions that may result in injuries associated with motor loss/coordination or chronic pain. Introverts, too, are diagnosed with acquired disability, but often with diagnoses that are “non-traumatic” (Malec, 1985). This doesn’t mean Introverts are not involved in motor-vehicle accidents, or risky behavior that results in injury. The research simply shows that extroverts are more likely to choose activities that could result in these types of disability. Frustrated in my search for information regarding “version” types and acquired disabilities more like my own — those that are the result of genetics and/or “unspecified contributors” for deafness and Meniere’s disease, I continued searching the research databases. I came across an interesting study by Noonan et al., (2004), called, “A Qualitative Study of the Career Development of Highly Achieving Women with Physical and Sensory Disabilities”. I figured I hit the jackpot with this search and find! What I discovered, however, has nothing to do with a connection between “version” types and successful coping with acquired disability. According to Noonan et al., (2004), successful coping includes “developmental opportunities (education, peer influences), family influences (background and current), disability impact (ableism, stress and coping, health issues), social support (disabled and nondisabled communities, role models and mentors), career attitudes and behaviors (work attitudes, success strategies, leadership/pioneering), and sociopolitical context (social movements, advocacy)” (p. 68). The difference between those who successfully cope and are extroverted and those who successfully cope and are introverted, centers around social support. An extrovert is more likely to identify and ask for help from any peers or individuals within their environment and in so doing actively engage in demonstrative advocacy. Introverts are more choosy about who they enlist support from, but are often “background” advocates. This is supported by research from Ellis (2003) in findings that include the difference in how extroverts and introverts enlist support, openly or privately – respectively. Having lived with special challenges for more than 31 years, I have had the (privileged) opportunity to meet hundreds of individuals who are differently-abled. Networking through organizations such as Fidos For Freedom, Inc., Assistance Dogs International (ADI), the Hearing Loss Association of America (HLAA), the American Association of People with Disabilities (AAPD), and numerous other organizations, I have met both extroverts and introverts who cope well — and some not so well — with acquired disability. Some discouraging research does suggest that extroverts are more likely to use assistive technology and devices (Johnson, 1999). I struggled for so many years with invisible disabilities and challenges, that my “epiphany” moment of changing that… making the invisible very visible, still gives me psychological goosebumps. My introverted life changed when I determined that I would embrace technology and assistive devices. I use bright canes, an assistance dog, bling up my cochlear implant and have informative brochures with me wherever I go. You’ll notice I didn’t say my introverted self became extroverted. I’m aware of and fully accept who I am – an introvert. Yet, using assistive technology and devices (and canine) has dramatically improved mitigating my own disabilities. Extroverts are more likely to seek “tools” early on in a diagnosis that incorporates an acquired disability (Wressle, Samuelsson, 2004; Kintsch & DePaula, 2015). Once introverts determine that the benefit of using assistive technology and devices improves quality of life, they, too, are able to embrace tools that improve life with the downside of making them (perhaps) more noticeable. In closing, can I just say, “I LOVE PEOPLE”? We are different yet, are alike. We react to things differently and yet similarly. We all love dogs. Cuz… well, that just makes sense. Ellis, A. E. (2003). Personality Type and Participation in Networked Learning Environments. Educational Media International, 40(1/2), 101. Wressle, E., & Samuelsson, K. (2004). User satisfaction with mobility assistive devices. Scandinavian Journal Of Occupational Therapy, 11(3), 143-150 8p. I hesitate to even post about this topic because I’m sure to get a little backlash about this viewpoint. Because of that, you will see interspersed throughout this written confession, links of scholarly evidence and citations to peer-reviewed articles that will lend a little more credence to what I’m about to say. I don’t want it to be just an opinionated article, after all! Now if my mother is reading this, she is likely “nodding her head in agreement” but that is because her clearest memory of me is the bossy older sister, not at all afraid to confront people (they call me Vina Jewell Jr. in my family), and stubbornly opinionated. However, when you grow up in a small farming community and go away to college, there isn’t much chance your mother will be able to get to know the adult you’ve become. Don’t get me wrong. Mom and I talk weekly. But a FaceTime call is a great deal different than seeing someone day in and day out. However, the fact that I don’t play well with others as an adult has nothing to do with the negative characteristics I hope to have left far behind me in my childhood. 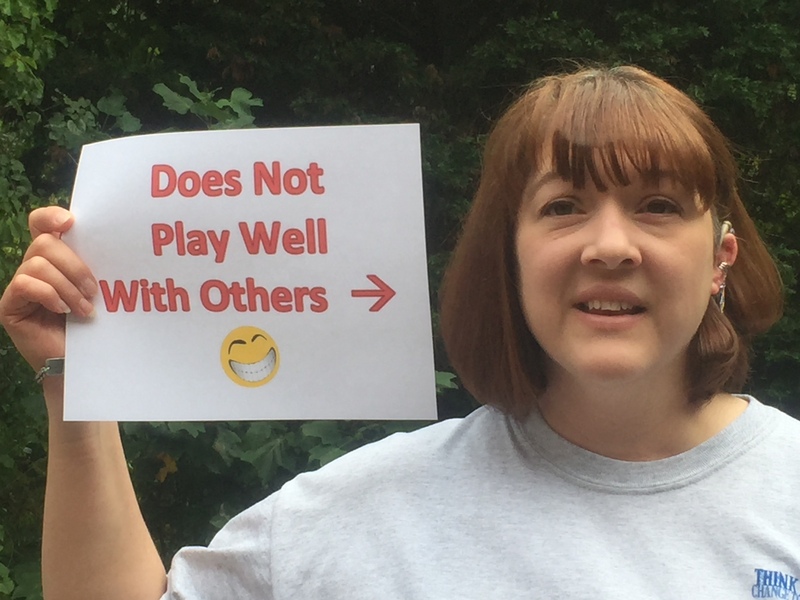 As a 49-year-old woman who readily identifies as being differently-abled, “playing” often means quiet, reflective time, or interactions where I’m present but only “just”–in that I do not have to interact with those around me. For example, my husband and I will watch a movie together once in awhile. I’m a reader. I write. I research (by choice and not because I’m a doctoral student). I love sitting on the deck and staring out into the woods. I love to cuddle with my dogs. Now some who read that last paragraph may think that I don’t like people. I love people, and enjoy interacting with others. I believe anyone I work with will tell you that I am an eager team player who throws herself into volunteer work with passion and gusto. You see… I WORK well with others. Outside of class, I proudly advise three different student clubs and participate in a number of faculty/staff committees. I love this work. I love the people I work with, too. However, I’m working – not playing. I’m one of the lucky ones in that as a person who is differently-abled, education is a great career. People with skills, training, and education in other types of careers are not as lucky. Many people with disability or chronic illness find that in their chosen career they face both exclusion and discrimination (National Disability Strategy Consultation Report, 2009). I am extremely grateful to be a part of the education community, for I rarely face these issues. So what’s the deal with my not “playing well with others”? Well you see? The things I mentioned earlier that are ways I unwind, decompress, relax, and “flourish in my happy place”, very few people are willing to do alongside me. (And that’s ok…) I have a few friends that will “hang out with me” and “play” with no expectations. We do not have to do a whole lot of talking. We just “are” – and are comfortable in silences and quiet places. The problem is that none of these friends live near me. It may be different for folks with other types of challenges. As a person with hearing loss, I can tell you that one of the biggest barriers to living a happy and productive life alongside of others, is background noise. Some folks think that background noise is the same thing as white noise. White noise is a steady (and unremarkable) buzz of sound. If you are as old as I am, it would be like the “snow” sound on a television channel currently off the air. When I was a kid, my older brother and I would sometimes be allowed to stay up watching TV, and we’d eventually fall asleep. When I awoke, the television screen would have “snow” with a buzzy kind of static-like noise. Background noise, on the other hand, is any extraneous sound that is heard while trying to monitor a specific sound. For folks with hearing loss, that specific sound is SPEECH while trying to screen out other sounds (and perhaps voices) from the environment. If I could burn calories for every minute I communicate with others in the normal world, I would not be 25 pounds overweight. Background noise is the enemy of people with hearing loss. This noise even diminishes our ability to concentrate and form both short-term and long-term memories (Rugg & Andrews, 2009). Kenneth Henry (Neubert, 2012), postdoctoral researcher at Purdue, uses the analogy of numerous televisions. For folks with normal hearing, it would be like turning on a dozen television sets on different channels and asking the individual to concentrate on one show. It’s hard. It’s not at all enjoyable. It’s not something someone would ever do by choice. “We are all going to go get a pedicure! We are meeting at 2 PM”. This is not my kind of “play time”. Now occasionally (OK… I’m exaggerating – RARELY) I will go out and do some of these things. However, there are very few people I can ask to participate in what I really consider “fun”. Even when I go out with friends from Fidos For Freedom with individuals who have various disabilities it is hard. When you do not hear well, you can be isolated even when amongst folks who really understand disability. Folks with hearing loss “play” differently. Having a hearing loss as an adult – even when it is “corrected” by hearing aids and/or cochlear implant, the individual is certain to have a co-morbid auditory processing disorder. This creates all kinds of communication issues that make it extremely difficult to enjoy communicating. According to Whitelaw (2015) “These types of communication issues may include difficulty hearing in less than optimal listening situations, reliance on visual information to augment auditory information, a reduced appreciation of listening to music, and difficulty understanding speech when the speaker is unfamiliar” (para. 1). I have special programs on my cochlear implant that reduce background noise and allow me to zero in on the person right in front of me. I rely on these programs. (There have actually been times in extremely noisy environments, that I swear I hear better than my normal hearing counterparts). Even with this wonderful technology, I still have to concentrate. It’s not fun. It’s not “play”. It requires recovery time later. Is it worth it? Well if it wasn’t, I would never leave home… and I leave home a great deal and for a variety of reasons. Just because I CAN doesn’t mean it is easy. I’ve been alive long enough to know that important things are not always easy. If you know someone with hearing loss, please allow me to provide some “playing pointers”. You will note that these activities often revolve around just being in the presence of each other. They are activities that do not require dialogue every second of your chosen “together time”. Board games: It’s OK, to laugh and “chit chat” over a great board game. But… turn off the TV. Don’t have background music going. If there are more than two people playing the board game, don’t have individual conversations. Every spoken word is meant for everyone present. This keeps the person with hearing loss from having to deliberately ignore the sound of a conversation not meant for them. Please don’t think that people with hearing loss can enjoy “game night” with a big crowd. The folks in my small group at church had a “game night” (with all in the family invited) one night and my first thought was, “just shoot me now“. 2. Books, reading, and discussion: Book clubs are great! That is… if the discussion group is meeting in a quiet setting while discussing the chapters that week. Sitting in the food court of the mall and discussing what you read that week = NOT A GOOD IDEA. If you like to read, ask to spend some reading time with a person with hearing loss. You read; you don’t talk. It is difficult to express how meaningful it is to simply be in the presence of another. 3. Walks, hiking, boating, and other “outdoorsy” stuff: These activities can be great for folks with hearing loss. However, many trails and parks and lakes have become very populated. This means that the person with hearing loss may have trouble hearing you if they cannot see your face. Imagine kayaking with a person with hearing loss. If the kayaks are facing each other they will do great. This also means you won’t get anywhere because two kayaks facing each other cannot move. So enjoy the time together but don’t try to tell them all about the problems you’ve been having at work. Enjoy the hike. Enjoy the quiet of the walk. Enjoy the sound of the paddles hitting the water – and the far distant sounds of other folks out on the water. 4. Movies: I’m a “hearing again” person. This means that I can go to a movie, watch it, understand it, and give it a Siskel and Ebert “thumbs up” or “thumbs down” vote — just like everyone else. This doesn’t mean I can converse about the movie as we exit with the crowd. This doesn’t mean I can walk all the way to the parking deck and discuss everything we loved about the movie. Give me a safe place to stop moving. Allow me to concentrate on the conversation. 5. Gardening, Fishing, or ART: I love gardening, though do precious little of it I’m afraid. I had a great little “deck veggie garden” this year but wondered why I didn’t feel the thrill of it like I experienced it years ago. I concluded it was because I wasn’t pulling weeds alongside my father. I realized I wasn’t thinning plants while with my grandmother just three plants over. Be willing to spend some quality quiet time gardening with a person who doesn’t hear well but enjoys getting down in the dirt. Fishing can be a great activity. Art, too, can be a great opportunity to spend some time with an artsy hard-of-hearing person. Some great resources: LISTENING IS EXHAUSTING. What if your challenges are not hearing loss. People who live with disability, chronic illness, and visible or invisible health problems may still “play” differently. As a person with a balance disorder, I cannot go to the fair at the county fairgrounds and “play”. I cannot walk to the park and “swing” on the swing set while discussing heart-to-heart issues. If you want to spend time with someone who has specific challenges, ask them what they like to do and meet them where they are – within the parameters of what is “fun” for them. They may have a really hard time meeting you for some “play time” when it will be WORK for them. Ask how to accommodate them. I promise you that they really do enjoy being with you. 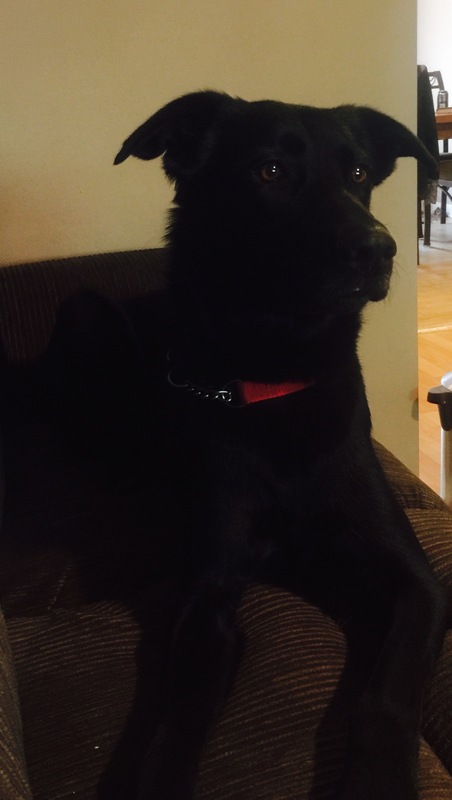 Milo Cade – Fidos For Freedom, Inc., Service Dog. Many of Hearing Elmo’s readers know that I retired my service dog, Chloe, this year. Since May 1st, she is enjoying retirement and still does some hearing alerts at home. She is happy, spoiled, and we believe well-deserving of all the naps and belly rubs she is currently receiving. 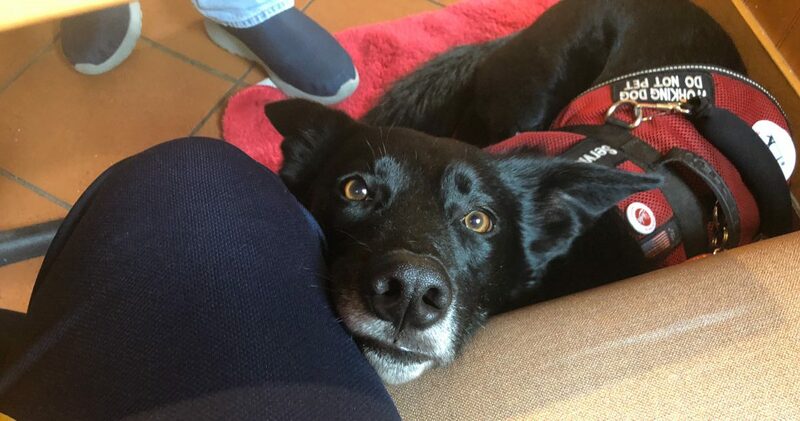 I was recently matched with Milo, from Fidos For Freedom, Inc. Milo is a shepherd/lab mix and I am enjoying the process of being partnered with a mobility/balance service dog versus a hearing/balance assistance dog. We determined my primary needs are mitigating issues with Meniere’s disease and not hearing alerts. I love my cochlear implant, and feel like I have adjusted to the world of “hearing again” very well. My balance is, and will continue to be, a major issue. I suppose in a way, this is an introduction of my new partner, Milo. One thing I have enjoyed is experiencing MY world (work, church, walks, etc.) through the eyes of a newbie. For Milo, everything in MY world is new. He looks at everything in awe. If he isn’t looking in awe, he is sometimes in “investigation mode”. At a training session with my trainer a week or so ago, I brought Milo to one of my classes. I had allowed enough time to exit the service dog safely from my car. I had allowed time for a short potty break. (Honestly, Chloe hasn’t been at home long enough for me to get out of the habit of some of these things. I found myself at a potty area recently and realized I didn’t have a dog by my side!). I allowed enough time. Not. I did not allow time for all the new things my newbie partner was seeing. The grassy area was new. The trees and picnic bench were new. The ramp into the building was new. The automatic door push-button was new. At least… it was new to MILO. For just a brief second, I was mildly annoyed. I had not allowed time for appraising all of these new environments. That was MY bad, not Milo’s. I want my dog to be confident and aware of his surroundings. I was almost late to class, but the time I took “extra” was time worth taking. Newbies need some extra patience from those of us who are veterans to the schedule and environment. We owe it to them. But you know something? I really know how to blow it. I mean, I don’t do anything half-way. This isn’t always a good thing. I recently became extremely exasperated with someone relatively new to “hearing again”. I try hard to be a positive advocate for people with disabilities, and chronic and/or invisible illnesses. This blog is, in part, a way that I try to raise awareness and encourage people to talk about tough subjects. I realized then and there that I needed to put myself in newbie shoes more often and remember how difficult those early years were. Advocating and educating take time. Families and friends do not just wake up overnight and suddenly “get it”. I told her that I often forget how hard those early years were, and that she had to keep at it… eventually some of it would start to sink in for her family members. As a person of faith, I believe everything happens for a reason. We may not always like the purpose behind God allowing something to happen, but there is always a reason. I’m also (gulp) old enough now to know that we may not EVER completely understand why something happened this side of Heaven. I have ALWAYS felt like that the acquired disabilities I have were allowed so that I could help others… or at least try to do so. I blow it. I blow it BIG. However, I think those of us that have lived the life a few years, owe it to the newbies in our lives, to lovingly coach, encourage, cheerlead, advise, and HUG often. You are going to have newbies in YOUR life. Unless you are isolating yourself, you will have folks new to whatever “ails ya”. People will look to you for understanding and advice. You will be able to empathize much better than their doctor, their families, and their co-workers. Of all people – YOU get it. Are you looking for a way to invest your life in someone with similar challenges? There are opportunities everywhere. You simply need to know where to look. Urban areas often have face-to-face support groups for various illnesses and disabilities. There are numerous online support networks, discussion forums, and peer supports. Many doctor’s offices and rehabilitation specialists have contacts to support personnel. Invest yourself in the life of a newbie. Remind yourself while investing how difficult those first years were! It shouldn’t surprise you to discover, sometimes by accident, the student becomes the teacher. Always, always be teachable. Chronic Pain (Part FIVE) : What Does Giving Up Look Like? Advocacy is FREE and its never-ending ripples spread awareness for all worthy causes! A meeting place to connect and find support while living with a vestibular/balance condition. ...now New and Improved -- with Bionic Hearing!